WPC, wood plastic composite, often referred to as water proof core, is the next generation of luxury vinyl flooring. 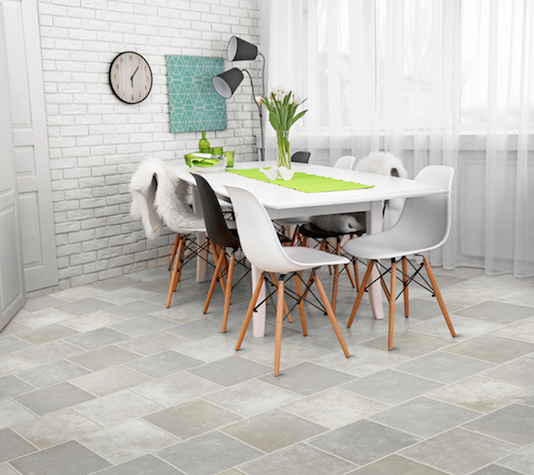 It’s counterparts, LVT and LVP (luxury vinyl tile and plank), plus rigid core luxury vinyl (also known as rigid core, multilayer flooring, or SPC - stone plastic composite), each have their own unique characteristics and performance abilities – but some say WPC is the perfect combination of superior performance, style and design, ease of installation plus moisture resistance. WPC is a fusion of a topmost wearlayer, a vinyl layer, a thermoplastic core and a backboard or attached underlayment. The WPC core is a composite material made of a thermoplastic, calcium carbonate and wood flour (although most manufacturers are moving away from wood flour). This core material is often aerated to give it extra thickness, increased dimensional stability, superior insulation qualities and allows for wider, longer board configurations. For these reasons, WPC sits atop the luxury vinyl category in virtually every area from performance to fantastic visuals and design. And, it is priced accordingly; prices range generally between $3 to $7 per foot. While all luxury vinyl floors share a vinyl core layer and technologically advanced wear layers for outstanding performance against stains, scratches, spills, scuffs and plus easy maintenance, WPC offers more. 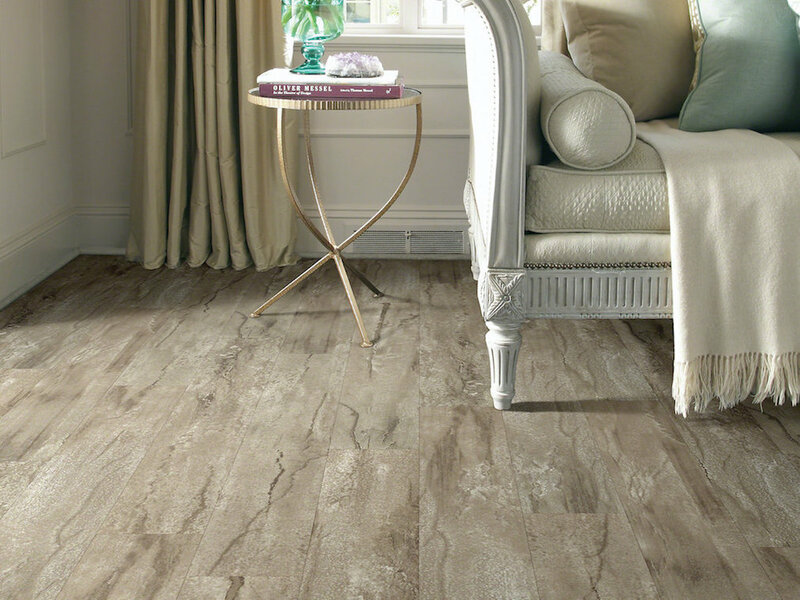 For one, it does not telegraph subfloor imperfections the way more flexible LVT and LVP can. This also allows for WPC to be installed directly over most existing flooring (although not recommended over carpet). WPC’s thermoplastic core provides improved dimensional stability so it doesn’t have the expansion and contraction issues common with some other LVT/P product. It also offers improved dent resistance that is second only to rigid core luxury vinyl. 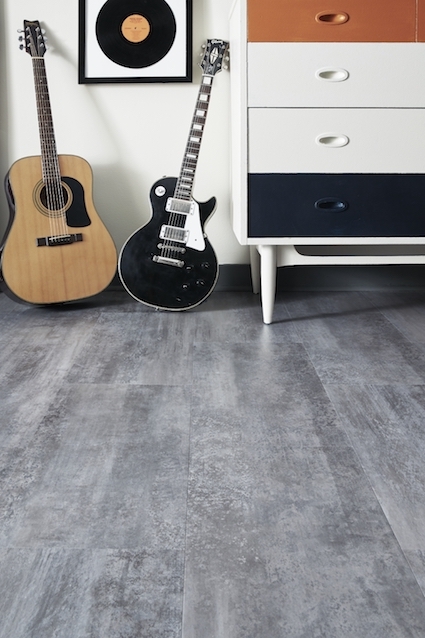 Click installation systems which were developed for laminate flooring, made their way to LVT/P and now WPC’s increased core thickness makes them more stable and easier to install. But where WPC really shows its stuff over other luxury vinyl offerings is in style and design. That same increased core thickness allows for deeper embossing and graining effects that, when combined with high-definition printing technology, provides fantastic visuals that are just a notch below the real thing. 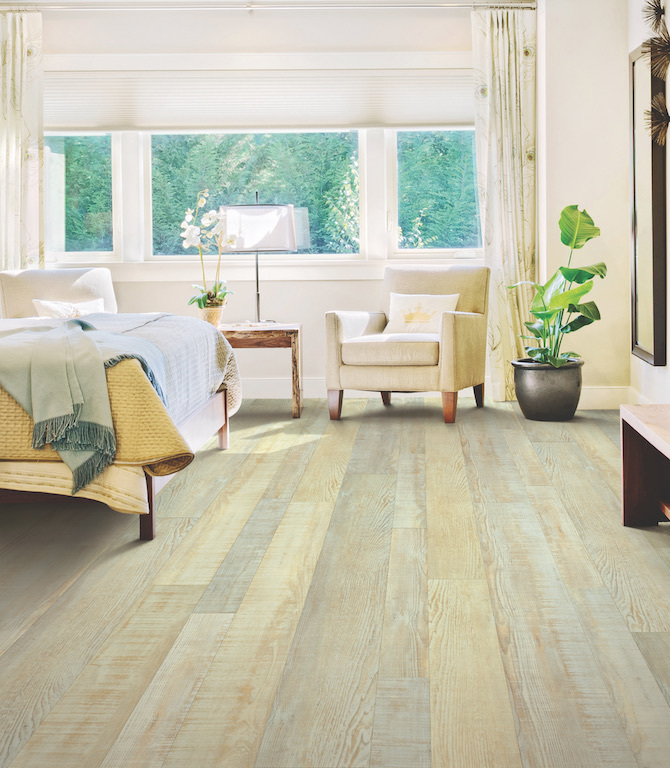 It seems that every manufacturer wants to call its WPC by a different name – enhanced vinyl plank, engineered luxury vinyl, waterproof vinyl – throw in the various luxury vinyl offerings – LVT, LVP, rigid core vinyl, SPC – and you end up with an alphabet soup confusing choices. There are differences between WPC products – in core thickness (4mm, 5.5mm, 6.5mm and 8mm) as well as differences in wear layer thicknesses (8 mil, 12 mil and 20 mil) with thicker floors being the premium offering (and are suited for commercial settings). WPC can literally be used anywhere in the home, most often in kitchens, bathrooms and laundry rooms but now making its way into children’s bedrooms, dining rooms, home offices and even living rooms. How does it compare to laminate? To be fair, laminate is less expensive, has better visuals and now, with moisture resistant treatments, can be used in more spaces than ever before.